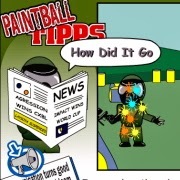 The Tippinators are pleased to announce the release of the second video in the Paintball Tipps series. This latest video focuses on the safety and how easy it is to keep the game safe for everyone. This episode was inspired by an email we received from a viewer. "We received an email from a viewer asking about safety." said Tippinator Bruce 'Charon' Johnston. "Safety is so integral to everything we do as players that we had to produce a safety video."